Introduction: The vascular affections of temporal bone follow similar clinical symptoms and signs and can be distinguished through radiological investigation. The usual ones are: paraganglioma, high jugular bulb and aberrant internal carotid artery. The paraganglioma are vascular tumor formed by capillaries and pre-capillaries vessels originating from neuroectodermical cells. The jugular bulb is the anatomic point which joins sigmoid sinus and jugular vein; it is called high jugular bulb when the jugular vein protrudes into tympanic cavity. The carotid artery enters the etrous bone through the carotid canal that is apart from jugular vein by carotid sheath, in initial vertical segment it is apart from the middle ear by a bone plate. The abnormal course of the carotid artery can be explained by an embryological malformation that prevents bone plate formation. Objective: The target of this study is to report five cases of vascular affections of temporal bone and to discuss their differential diagnostic and therapeutic approach. The vascular affections of temporal bone follow similar clinical symptoms and signs and can be confirmed through imaging exam. The most common differential diagnoses are: paragangliomas, high jugular bulb and aberrant carotid artery (1)(2). The proper identification of vascular lesion of the temporal bone might prevent complications related to the treatment of such diseases. The paragangliomas of temporal bones are vascular tumor formed by capillaries and pre-capillaries vessels originating from neuroectodermical cells (3). They are benign tumors and rarely become malignant ones (4) (5). They can be located in the carotid body, in the adrenal medulla, in the jugular bulb, in the Jacobson's nerve (branch of the glossopharyngeal nerve), in the Arnold's nerve (auricular branch of the vagus nerve), from the jugular fossa up to the middle ear promontory (5). Its denomination is in accordance with its origin: glomus jugulare, glomus tympanicum, glomus carotid and glomus vagale. The jugular bulb is the anatomical area that corresponds to the joint of the sigmoid sinus and the internal jugular vein. It is called high jugular bulb when the jugular vein protrudes into the tympanic cavity. It is an anatomical variation that presents variable occurrence according to its localization: 6% when it is placed above the inferior limit of the tympanic annulus (7); 25% when it is above the inferior plane of the round window (8). 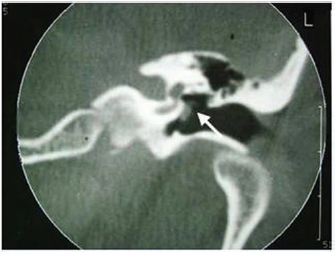 Page, in 1914 (9), was the first to described the high jugular bulb which underwent hemorrhage after a myringotomy procedure. 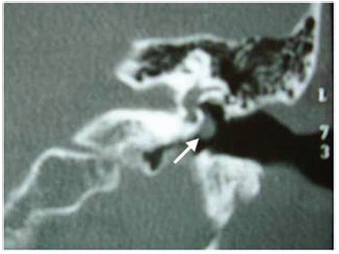 Other authors reported hemorrhage after a post-elevation of tympanomeatal flap (10). There is predominance on the right side due to an expressive widening of the dural sinus and of the jugular vein to the right in 75% of the individuals (10), and it is bilateral in 16% of the cases (11). The aberrant internal carotid artery in the intratemporal portion is extremely rare, by affecting only 1% of the population (12). It usually penetrates into the petrous bone through the carotid canal that is apart from jugular vein by carotid sheath. In the initial vertical segment it is before the cochlea and apart from the middle ear by a 0.5-mm-thick bone plate (13)(14). The abnormal course of the carotid artery can be explained by an embryological malformation of the 1st and 2nd branchial arches which result the persistence of embryo vessels and subsequent anastomosis in the middle ear, by preventing bone plate formation (12). The target of this study is to report five cases of vascular affections of temporal bone and to discuss their differential diagnostic and therapeutic approach. RHL, a 55-year-old female patient, Caucasian, searched for assistance complaining of pulsatile tinnitus in the left ear since two weeks, and no other complaints. The physical exam showed a reddish lesion that occupied the posteroinferior fourth part of the tympanic membrane on the left with no deficit of the cranial pairs. The audiometric test showed the auditory threshold in normal condition. Image exams were based on Computed Tomography (CT scan) of the temporal bones and on 3D time-of-flight MR. CT scan showed an image with soft parts occupying part of the tympanic cavity over the promontory. The lesion was not adjacent to the hypotympanum (bulb f the jugular), nor to the internal carotid artery or facial nerve (Pictures 1 and 2). 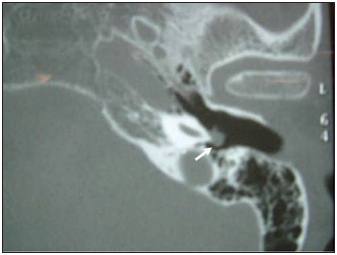 The 3D time-of-flight MR did not show any lesion in the middle ear, and it was observed agenesis of the sigmoid sinus to the right side with contralateral dilatation. It was suggested a certain quantity of Vanilmandelic Acid from the urine, a subproduct of the metabolism of catecholamine substance, and this was also in normal standard. Picture 1 - Computed Tomography of the temporal bones, axial cut, showing an image with soft parts on the left side over the promontory (arrow). Picture 2 - Computed Tomography of the temporal bones on the left side, coronal cut, showing an image with soft parts over the promontory and below the oval window (arrow). Patient was submitted to a surgical therapy through retroauricular approach with canaloplasty technique in order to properly visualize the lesion and its resection. The anatomopathological exam confirmed the preoperative clinical diagnosis of paraganglioma. There was an improvement during the first three months after surgery with no complications, and then an audiological exam was performed presenting thresholds similar to the exam done before surgery. EPZ, a 61-year-old female patient, Caucasian, searched for assistance complaining of itching and nasal obstruction. The physical exam showed a reddish image over the promontory on the left ear. There was no involvement of the cranial pairs. The audiometric exam showed auditory threshold in normal condition. 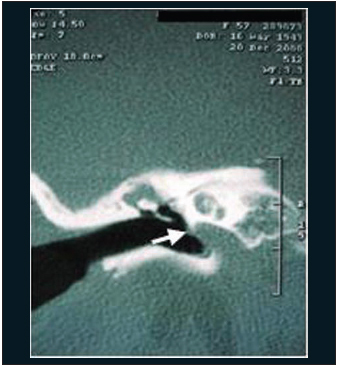 CT scan of the temporal bone was performed presenting an image with soft parts which were restricted to the promontory on the left side and were not adjacent to the jugular bulb, carotid artery or facial nerve (Picture 3). Picture 3 - Computed Tomography of the temporal bones on the left side, coronal cut, showing an image with soft parts over the promontory and below the oval window (arrow). The surgical therapy for this patient was the same one performed for the previous patient (Case 1). The anatomopathological exam confirmed the initial clinical diagnosis of tympanic paraganglioma. One month after surgery, during the follow-up, an audiometric exam was performed and it presented results in normal condition. LHS, an 8-year-old male, brown-skinned patient, searched for assistance complaining of night snoring, mouth breathing and hypoacusis. The physical exam showed tympanic membrane that was retracted and shineless to the left and also retrotympanic effusion to the right side. The preoperative audiometric exam showed conductive dysacusis to the right with bilateral curve B. The myringotomy approach was suggested to the right side with insertion of a ventilation tube and the myringotomy to the left side. During surgery, there was hemorrhage in the right ear. Due to that, surgery was interrupted and a CT scan of the temporal bones was performed, which showed high jugular bulb with a failure of continuity in the bone layer on the floor of the tympanic cavity to the right (Pictures 4 and 5). Picture 5 - Computed Tomography of the temporal bones, coronal cut, showing an opening of the bone layer and presence of mass with soft parts on the tympanic cavity floor (jugular bulb) on the right side (arrow). Patient was submitted to a clinical follow-up every six months and audiometry control. Three months after surgery, the audiometric exam showed conductive dysacusis to the right and curve type C.
FCS, a 61-year-old female patient, brown skin, searched assistance complaining of chronic otorrhea, hypoacusis and pulsatile tinnitus in the right ear. The physical exam showed tympanic membrane that was perforated in the anteroposterior fourth part and a non-pulsatile reddish lesion in the anteroinferior fourth part in the right ear and a normal condition in the left one. The audiometric exam showed conductive dysacusis to the right with a 25dB gap from 250 to 8000Hz, and tympanometry test was not performed. 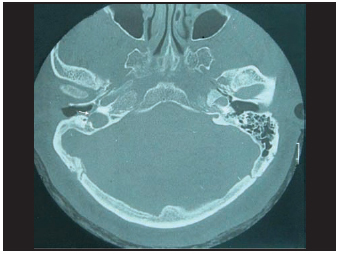 Image exams were based on CT scan of the temporal bones which showed high jugular bulb with a failure of continuity in the bone layer on the floor of the tympanic cavity in the right side (Picture 6). Picture 6 - Tomography of the temporal bones, axial cut, showing high jugular bulb with incomplete bone layer on the right side (arrow). It was suggested a clinical follow-up and orientation to patient regarding possible complications of the manipulation on the right middle ear. 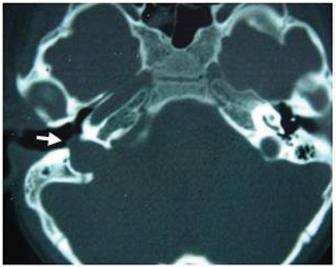 MSO, 64-year-old female patient, Caucasian, searched assistance complaining of chronic otorrhea, hypoacusis, pulsatile tinnitus in the right ear and also intermittent vertigo symptoms. The physical exam showed tympanic membrane that was perforated in the posterosuperior posterior-superior fourth part and a reddish and pulsatile lesion in the anteroinferior anterior-inferior fourth part. The left ear had no alterations. Audiometric exam showed conductive dysacusis in the right ear with a 30dB gap and sensorineural dysacusis in 8000Hz in the left ear. Imitanciometry testing was not performed. Image exams were based on CT scan of the temporal bones which showed intratympanic lesion and absence of bone cover of the carotid canal in the right side (Pictures 7 and 8). Picture 7 - Computed Tomography of the temporal, coronal cut, showing an opening of the bone layer and presence of lesion with soft parts on the tympanic cavity floor (aberrant internal carotid) on the right side (arrow). Picture 8 - Computed Tomography of the temporal, axial cut, showing intact carotid canal on the left side and absence of bone cover of the carotid canal and lesion with soft parts on the right side (arrow). Clinical manifestations and physical exam of the vascular affections of the temporal bone are similar, though their etiology may vary, and that can involve other noble structures. Paraganglioma is the most common benign neoplasm that affects the middle ear. Due to that, it is important to diagnose it as soon as there is an evidence of a reddish lesion in the inferior portion of the tympanic membrane associated to a pulsatile tinnitus and hypoacusis. The first case initially presented pulsatile tinnitus, the most common symptoms, which it is in accordance to the literature (6). The other symptoms can be hypoacusis, ear pain, ear fullness, vertigo, otorrhagia and headache. However, because it is a low-growing tumor, the symptoms, sometimes, arise when it has already achieved large dimensions. Hypoacusis is initially conductive and it can develop itself into sensorineural when the cochlea is involved (6). The immitanciometry testing can show a displacement of the balanciometer needle with the patient's pulse in a synchronized way (15). Due to the initial state of the disease, the reported cases presented the audiometry test in normal condition, and a well-delimitated retrotympanic reddish tumor could be visualized in the otoscopy. CT scan is the exam that is preferred to investigate the paragangliomas because it defines the bone limits, the tumor localization and extension in the middle ear, what it makes enough to diagnose the current cases. In order to help the diagnosis, the MR imaging test can limit the tumor relations with the soft parts of the neck, larger vessels or intracranial extension, whereas the digital arteriography shows the vascular lesion and the vessels that irrigate the tumor (1). Therapy can be both palliative and definite as according to the localization and extension of the tumor, age and general condition of the patient. The radiotherapy or clinical follow-up can be recommended for elderly patients with no proper clinical conditions (4)(6). Surgery is the preferred and definite therapy. The retroauricular approach with extension to facial and hypotympanum recesses is recommended when it is not possible to visualize all thresholds of the tumor (6). 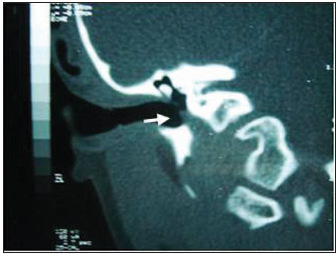 In the reported cases of paraganglioma tumor, it was performed the retroauricular approach with little canaloplasty. After identifying the tumor, it was displaced from the promontory and cauterized vascular pedicle. The high jugular bulb is a morphological alteration of the intracranial vessels in which the internal jugular vessel projects into the tympanic cavity. It may occur from 5 to 25% in accordance with its localization (7) (8), being the right side is the most common one (11). In clinical terms, it can present no symptoms, and it is less frequent to symptoms as pulsatile tinnutis, conductive or sensorineral hypoacusis (7). In the otoscopy, it can present itself in normal condition or with a purple lesion in the posteroinferior fourth part of the tympanic membrane, as it is in the physical exam of Case 4. CT scan is preferred because it limits bone anatomy and can differ IT from the other vascular lesions. If there is uncertainty after performing CT scan, the diagnostic evaluation can be completed with non-invasive angiography (1). The CT scan of temporal bones of the current patients showed high jugular fossa with incomplete bone layer on the floor of the tympanic cavity and also the protrusion of soft parts in the middle ear, what could establish the diagnosis of the high jugular bulb. The treatment can be clinical, surgical or via embolizatioin. Some authors have showed failures on the surgical treatment in patients with conductive hearing loss originated from high jugular bulb, and no reversion (of the loss) after surgery (9). The clinical follow-up was recommended due to the high rate of low success and morbidity by the surgical therapy. The aberrant carotid artery in the intratemporal area is extremely rare (12). Patients can present symptoms as pulsatile tinnitus, conductive hearing loss, ear pain, ear fullness and vertigo or no symptoms at all (14). Patient presented conductive hypoacusis, pulsatile tinitus and intermitent vertigo symptoms. Dysacusis can be conductive when the lesion achieves the round window level, the incudo-stapedial articulation or the tympanic membrane; curve type B can be observed in the tympanomety, which it is similar to Case 5. CT scan defines the bone structures of the temporal bone. The vascular organization confirmed the diagnosis, by showing lesion with soft rounded parts in the inferior portion of the tympanic membrane to the right, and confirming the diagnosis of aberrant internal carotid artery in the right side. 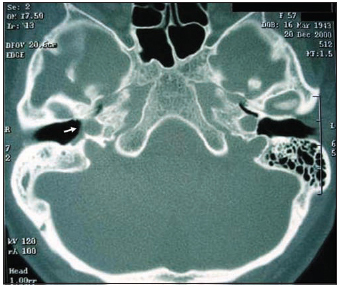 The etiological diagnosis of different vascular affections of the temporal bone is important due to the risk of complications associated to improper manipulation. The diagnosis based on clinical history and on physical exam is not complete, so that it is necessary the imaging exams such as CT scan and MR imaging. 1. Physician (2nd year Resident Doctor in the Otorhinolaryngology Service of the HSPM). 2. Physician (3rd year Resident Doctor in the Otorhinolaryngology Service of HSPM). 3. ENT Doctor (former resident in the Otorhinolaryngology Service of the HSPM). 5. PhD in Otorhinolaryngology by FMUSP (Assistant doctor in the Otorhinolaryngology Service of the HSPM and DERDIC/PUCSP.). 6. PhD in Science by the Post-Graduation program in Otorhinolaryngology and Head and Neck Surgery of the Otorhinolaryngology Service of the HSPM). Instituition: Otorhinolaryngology Service of the Hospital do Servidor Público Municipal (HSPM) - São Paulo. This article was submitted to SGP (Sistema de Gestão de Publicações) of R@IO on July 17th, 2007 and approved on May 17th, 2008 at 18:45:28.